Large double bed (150cm x 190cm), beside table, wardrobe, dressing table. Cot available on request. Air-conditioning with heat pump. 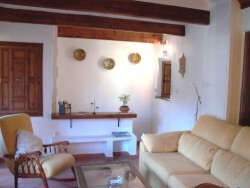 Self-catering holiday house in the heart of the historical Albayzín quarter of Granada with wonderful views on the Alhambra and the Generalife gardens. Lovely small 2 floor house that has been comfortably furnished to provide good standard accommodation ideal for couples and families alike. Located in a pedestrian street in the historic quarter, Albayzin, at 2 min walking distance from Plaza Nueva (city center). 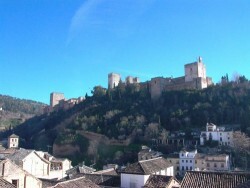 Enjoys a wonderfull view of the Alhambra, Generalife and Sacromonte. The house has air condition, heat pump, phone and WLAN (Internet).